On Friday I had to do some work on an Oracle Application Express (APEX) application of a client which I did some time ago. I had to create a new region next to an existing region on a page which had already several other regions on it. Normally no big problem, you would just use the “Column” property of the region and you are done. To make it short, it didn’t work because of the layout of the template and the existing regions which are already using the “Column” property. Do you want to improve the usability of the Oracle APEX Shuttle Widget a little bit? Let’s enhance it by adding support for double click. It will allow users to double click on an entry in one of the two lists of the shuttle, to move the selected entry to the other list as they would normally do with the corresponding icons. I think that’s a little bit more convenient and faster than using the icons. There comes the necessary code. ApexGen: A new Oracle APEX related open source project! ApexGen is a utility to generate Oracle Application Express (Apex) pages and page components based on a PL/SQL API, in a fraction of the time it takes to manually create report and form pages. In Oracle Forms that’s quite simple. You just have to rename the trigger to use underscores (eg. PRE-QUERY to PRE_QUERY) and the trigger doesn’t fire anymore. But how can you do that in Oracle APEX? Oracle Application Express (APEX) has a “hidden” gem (ok, there are a lot of others too) which in my opinion isn’t widely used by the developers. Be honest, how often do you use the little “View” select list on page definition? You should, because it has several useful entries which can make your life easier! But let’s have a quick look at the different options. Did you know that you can use the keyboard shortcut Ctrl+Return in the SQL Commands textarea of the Oracle APEX SQL Workshop application to execute the current SQL statement? 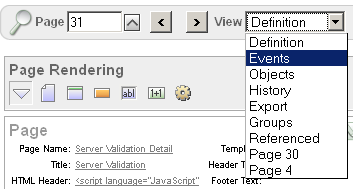 That’s really nice, especially if you are used to it from PL/SQL Developer/TOAD. There is a new beta available, with lot of features, compared to the one hosted by the Firefox extension web-site. ApexLib: Get a Page Flow Diagram of your application! Yesterday I came across Graphviz and remembered that a college had already used it to generate some ERDs/Class diagrams. After taking a closer look, I thought to give it a try and use it to generate a page flow diagram for an APEX application as you can also see it for JSF in JDeveloper. If you are using Firefox for your APEX development you may want to check out my list of add-ons I’m currently using for the web development. If you have any useful add-ons you are using, drop me a note! Bored of setting the template property again and again? For example you like the “Standard, Alternating Row Colors” template for reports or you don’t want to write help texts (which developer does?) for your items, but the Oracle APEX builder always defaults the item to “Optional Label with Help”.